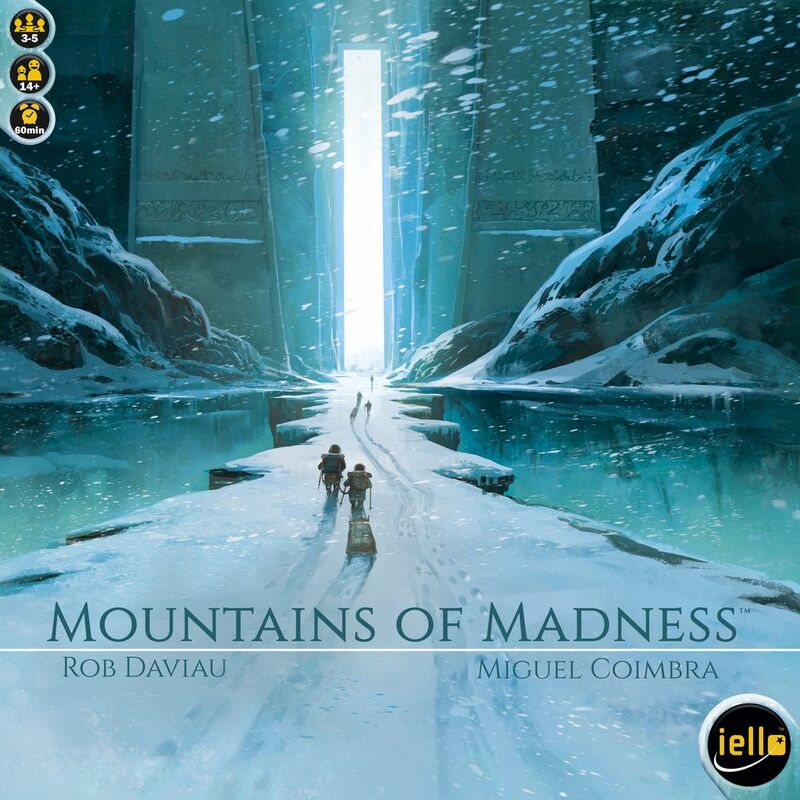 Mountains of Madness is a game by Rob Daviau, published by IELLO. It is for 3-5 players. In this game, players take on the role of scientists on a daring expedition to Antarctica where they have discovered an ancient city behind a chain of nearly impassible mountains. They will have to work together to not only survive the harsh weather and rugged terrain of the mountain but also the attacks on their very sanity. Communication is the key as they try to discover one of a kind relics in this hidden city. In the end, if the expedition is able to recover more relics without suffering too many injuries, then the players will be declared the winners. However if their injuries prove to great, the mountain will have claimed them and all hope of discovery is lost. To begin, the mountain board is placed in the middle of the play area. Each player choose a player board and places it in front of them on whichever side they choose. The Encounter Tiles are sorted by type and a set number of each are placed face down randomly on the matching spaces on the board. The Injury Card deck is placed face up on the board in it’s space, as is the Arcane Equipment Card deck and the Relic Card deck. The Equipment Cards are shuffled and placed faced down on their space on the board. A number of Injury Cards are drawn from the deck equal to the number of players and placed in the Equipment discard stack. The Madness Cards are sorted by level and placed into face down stacks that are shuffled separately. These are then placed on their spot on the board. Each player is then dealt a number of equipment cards determined by the number of players. These may not be shown to any other players. The Sand Timer is put on it’s space on the board, while the Penalty Die and Relic Tokens are placed near the board. The first player is chosen and assumes the role of Leader for the first turn. The Airplane and Sled Board are given to the first player, who will then place these in front of themself. The 6 Leadership Tokens are then placed on the corresponding space on the Sled Board. Finally, the Leader will deal out a number of Madness cards based on the number of players. Once this is done, play now begins. The game is played over several turns. Each turn is divided into 5 phases; Movement, Encounter, Resolution, Draw and Rest. The first phase is the Movement phase. In this phase, the Leader will decide which direction to move the expedition, starting from the Coast and eventually moving onto the mountain, through the city and into the Edge of Madness before escaping through the sky. The players are able to discuss which path they think is best but ultimately the decision rests with the Leader. On the first turn, the Leader will take one of the Coast tiles and place it in front of them, placing the airplane onto the empty space. In later turns, the Leader must choose an adjacent space to move the airplane to. This may be be to a uncovered tile or into an empty space that had previously been taken. It should be noted however that the players may not stay on the same space. They must move. Also of note, when the players reach the Edge of Madness tile, they are no longer allowed to descend. They must try to escape by moving onto the next Escape tile for each of the next 3 turns. At the end of the turn where they moved onto the third escape tile, the players have escaped and the game ends. One last thing, in this phase the Leader can elect to discard one or more Leadership tokens to allow a player chosen by them, to ignore their Madness card for the rest of the turn. More on Madness Cards in a bit. The discarded Leadership tokens are moved from the Sled Board to the Leadership Token discard area on the board. The next phase is the Encounter phase. In this phase, the players deal with the Encounter tile until the Sand Timer runs out. First the Leader will turn over the Encounter Tile if it’s not already face up in front of them. They will then turn over the Sand Timer. At this point, any player that has a Madness card is forced to apply the effects of the card and must play accordingly. Madness cards affect a player’s ability to communicate by changing the way they behave, talk or move. Once the sand timer is no longer running, players are free to act normally, but must act as if they don’t remember their strange behaviors. Players are not able to discuss their Madness and may not show anyone else their Madness card. Once the sand timer is running, the players must use this time to gather any equipment needed to overcome the challenge as noted on the Encounter tile. Each tile will show 2 or 3 challenges along with the accompanying symbol for the type of equipment needed, as well as a number or range of numbers required to complete the challenge. Players are allowed to discuss which equipment they have in their hand at this time. Once players are ready they may play Equipment and/or injury cards by placing them face down onto the Sled board. This may be done at any time during this phase. As soon as a player places a card on the Sled board, any and all communication must stop immediately. Players are then able to play cards from their hand face down onto the Sled board until the sand timer runs out. If a player speaks or tries to communicate in any way, the Leader is forced to discard a Leadership token. Once the sand timer runs out, players must remain silent for a few more seconds as the Leader decides if they want to use a Leadership token or not. If they choose to use one, it is discarded from the Sled board and placed in the Leadership token discard area of the board. The Encounter phase is then restarted. The sand timer is flipped over allowing the players to once again talk and discuss. This can be done as many times as the Leader feels necessary. Once the Leader decides not to use any more Leadership tokens and the sand timer has run out, play continues on to the next phase. The third phase is the Resolution Phase. In this phase, players determine if they were successful in overcoming the challenge from the previous phase and seeing if they gained any rewards or suffered any failures. At this time, the Leader reveals all of the cards placed on the Sled board, comparing them to the Challenge tile and the values for each type of equipment needed. If the total value of each required equipment type equals or falls within the given range of numbers, then the challenge was a success. If the total value is higher or lower than the required number of range of numbers, then it was a failure. If the players succeed in at least one of the challenges on the tile, they gain the reward shown on the tile. Rewards can be one of several different things. It can be a Relic card that forces a player to also draw a Madness card or a piece of Arcane equipment. It can also allow the Leader to turn over a tile for a few seconds to scope out a particular section. It can heal an injury on the Sled board, returning it to the deck or even place Leadership tokens back onto the Sled board. Of course if the players failed at any of the challenges, they must also suffer any failures. For each challenge that the team failed to overcome, the Leader must choose a consequence. The Leader can choose for one player to take a Madness card or roll the Penalty die. If all players already have a level 3 Madness card, then this option is not available. If a player already has a Madness card, they must draw a card from the next level up. If all players have a level 3 Madness card and a card must be drawn, the Leader must discard a Leadership token from the Sled board. If there are no more tokens on the Sled board, then the Leader places one of the Leadership tokens from the discard area on the board, back into the box. If the last Leadership token is ever returned to the box, then the players immediately lose the game. If the Leader rolls the Penalty die, they must apply the effect indicated by the symbol. This may be an accident that causes the Leader to draw 2 Injury cards and add them to the Equipment card discard pile. If an Injury card must be drawn and there are no Injury cards left in the deck, the players immediately lose the game. The die result can also lead to confusion which forces the Leader to discard as many cards from the Equipment deck as the difference between the total value of cards played of the required type and the failed challenge value. The Penalty die can also create a loss of confidence that requires the Leader to discard 2 Leadership tokens from the Sled board. It should be noted however that the Leader can choose to discard a Leadership token to be able to ignore the rolled result and then reroll the Penalty die. This can be done as often as the Leader would like, by discarding a Leadership token for each reroll. Once the failures have been taken care of, all the cards that were played during the Encounter phase are discarded. The Encounter tile is set aside not to be used during the rest of the game. Play then continues to the next phase. The fourth phase is the Draw phase. In this phase the Leader deals Equipment cards out to each player, including themself. Cards are dealt out until either the player’s hand limit is reached or the deck runs out of cards. The hand limit is determined by the number of players. If there are not enough cards left in the deck for each player to refill their hand, the Leader choose who gets cards. The Leader can also discard a Leadership token from the Sled board to increase a player’s hand size by 1 card until the next Draw phase. Once cards have been dealt out, play passes to the final phase. The last phase is the Rest phase. This phase is optional. For this phase, the Leader can choose for the expedition to take a rest, following 3 steps in order. First, 1 Leadership token is is taken from either the Sled board or the discard area and is placed back into the box. Next any remaining Leadeship tokens in the discard pile are returned to the Sled board. Finally, the Equipment card discard pile is shuffled with the Equipment card deck to make a new Equipment card deck. The deck is then returned to it’s place on the board face down. It should be noted, that if the team has only 1 Leadership token remaining on either the Sled board or in the discard pile, they may not use the Rest option. Regardless of whether the Leader chooses to use the Rest option or not, the players check to see if the Airplane is on the third Escape tile. If it is, the expedition has escaped the mountain. If not, then the Sled board is passed to the next player in turn order and a new turn begins. The game continues until one of the end game actions occurs, as noted earlier. If the Leader is forced to return the last Leadership token to the box, the players lose. If the Leader must draw an Injury card and the Injury deck is empty, the players lose. If the airplane is on the third Escape tile at the end of a turn, the players have escaped the mountain and must then check to see if they were successful or if they failed. If the expedition collected less Relic cards than there are Injury cards in the Equipment deck, Equipment discard pile and all the player’s hands combined, then the players lose. If they gathered an equal amount or more Relic cards than Injury cards in the Equipment deck, Equipment discard pile and all the player’s hands combined, then the team wins. The amount of Relic cards over the number of Injury cards will determine just how successful the expedition actually was. This number is checked against the chart in the rulebook. This game has some truly great looking pieces. The board is amazing. It looks like something painted for the cover of a H. P. Lovecraft book. The artwork really conveys the isolation and chill of the frozen mountain. The player boards are double sided and have a great looking photo of the character that it represents. Each of these has an overview of the different phases of a turn on it, which makes a great reference. These are made of really thick cardboard making them quite sturdy. The airplane figure is like a miniature model. It kind of reminds me of the models for the X-Wing Miniatures game or Star Trek Attack Wing. The detail on this really great. I especially like the call sign for the plane printed on the underside of the wing. It’s a neat little detail. The Sand Timer is a large wooden piece with red sand inside a glass tube. This thing is really nicely detailed and looks amazing. It’s very high quality and could have easily been substituted with a cheap plastic model instead. However IELLO chose to go with a much better quality version that I really love. The Sled Board and Relic Tokens are all thick cardboard, much like the player boards. I like the artistic design for the sled and how well it fits in with the theme and designs of the rest of the game. The Relic tokens are confusing and cover up portions of the player’s player board determined by the Relic card. It adds another thematic element to the game that really fits in with the madness aspect. The Leadership tokens are thick plastic pieces that have what appears to be a screen printed design on them. They are double sided and have the same image on each side. The Penalty die is red and has white icons engraved into it. There are 3 confusion icons, 2 injury and 1 loss of confidence on the six sided die. The images are quite large compared to the die which is quite nice. The Encounter tiles are also thick cardboard and have this nice looking icon on the back of each that fits in with the symbols on the board. The Escape tiles are a little smaller than the others. On the front side of the tiles is an amazing piece of artwork that showcases one of the different encounters that must be dealt with. The symbols are easy to understand and does not dominate or distract too much from the art. The cards are really great quality as well as the rest of the game. There’s not a whole lot of artwork on these but what little bit is there looks nice and fits in with the feel and theme of the game. Most of the artwork on these are found on the backs of each one. However the equipment cards do have a small pencil drawing of whatever piece of equipment it represents. I kind of wish there had been a bit more art on each of these, even though it does feel right already. One last thing of note is the insert. This game has a really remarkable insert that fits each of the pieces inside in it’s own place. Everything is sorted beautifully and looks great inside the box. Overall I’m really overcome with how nice each of the different pieces looks. It’s an amazing looking game that you have to see to believe. It’s definitely one of the most artistic and thematic looking games that I’ve seen so far this year. The rulebook for this game is really great. It has so many great looking pictures and tons of examples throughout the text of the book. Each of the different elements of the game are explained in great detail with some nice pictures to go with them. There’s a amazing looking picture of how the game looks set up along with the detailed instructions on how to set it up. Each phase of the game is explained in great detail, along with several examples with pictures on each phase. Throughout the book are these neat little pictures and pages that look like they were torn from a weathered journal. Each one feels like it tells a little piece of the story and adds a bit of theme to the book. The rulebook also includes an added expert variant, in case the game feels to easy. Overall I think the book fits in with the game’s theme really well. I didn’t see anything that was particularly difficult to understand. Everything is laid out rather well and is fairly easy to read through. All in all, I’m pleased with the overall look and feel of the rulebook. I love reading H. P. Lovecraft. His stories are so imaginative and creative. They really paint such an amazing world throughout each one. This game takes the idea behind just one of his stories, At the Mountains of Madness, and turns it into a sort of social deduction game. In some ways the game makes me think of Dead of Winter, The Thing Infection at Outpost 31 and Werewolf, just without the traitor aspects. In this game you’ll be trying to figure out the best route to take, minimizing the hazards as best as possible. You’ll also be trying to discuss the different pieces of equipment needed to succeed at the encounters. The problem is that you might not have all the pieces that you need to be able to do what needs to be done. On top of that, if a player has a Madness card, there’s no telling what they might say or do as you’re trying to get the right pieces in place. Even worse is that you only have 30 seconds to figure it all out. Those discussions and the planning remind me of the discussions in Werewolf as you try to determine who to exile. Have a character or two start collecting relics and when it’s there turn as the Leader, they aren’t able to do certain things. Of course you have those Leadership tokens to help you through the game. Thing is that you’d be surprised at how quickly you’ll be discarding them, especially if you have some inexperienced players. This is definitely one that you’ll want to play with older players as the tenseness and role playing aspects of the game may be too much for younger players. Even so, the game isn’t as deep and difficult as something like Eldritch Horror. This is definitely a game with a bit lighter feel. Thematically the game fits in perfectly with the story. I like the tenseness and desperation you can feel while playing. I like how each player will experience their own madness in unique and unusual ways. I also like how that everyone is working towards the same goal, collecting relics and escaping from the mountain. That said, the game almost feels like a Cthulhu themed party game, which is a bit odd. Not that it’s a bad game, it just isn’t exactly what I thought it would be. This one will work with groups of 3 -5 players but isn’t exactly family friendly. Not that there’s anything here that would be scary or inappropriate for younger players. It’s just that they may not understand exactly how to play or what is actually going on with this one. Overall I feel that fans of games like Elder Sign, Eldritch Horror and Arkham Horror that are looking for something a bit lighter, may enjoy this one. It’s definitely one that I would recommend giving a try, especially if you like Lovecraft’s stories. Mountains of Madness is a game of completing challenges and escape that is centered around H. P. Lovecraft’s story, At the Mountains of Madness. It’s a game of average length that is much shorter than most Lovecraft themed games. Most game sessions last around an hour. The components for this game are really great. I especially like the artwork on the board and the details of the airplane miniature. The rulebook is very thorough and covers everything quite well. It even has some artwork that fits in with the theme of the game. The theme is a major part of the game and can be felt in everything from the gameplay to the components. The game itself throws different challenges at the players that they will have to overcome together while role playing whatever quirks that the madness cards throw at them. 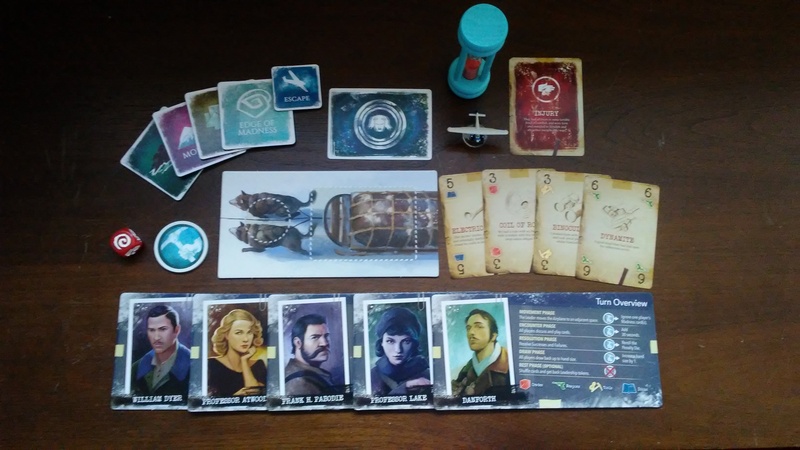 In some ways the game feels like one of those social deduction games like Werewolf, but it also has some of the same tenseness and feeling of games like Dead of Winter or The Thing Infection at Outpost 31. Fans of Lovecraft’s stories and games like Elder Sign, Eldritch Horror and Arkham Horror may enjoy this one. This is one that I feel works better with teens to adults, as younger players may have some difficulties grasping this one. This is one that I would recommend giving a try. I think with the right group it can be a good game that players will enjoy. As for me, I feel like it didn’t exactly meet my expectations as far as gameplay goes. I like it, just not as much as I wanted to. Maybe that’s how my Madness card affected me. This entry was posted in Reviews and tagged board, board games, card, card games, cthulhu, daviau, games, h, h. p. lovecraft, hp lovecraft, iello, lovecraft, madness, mountains, mountains of madness, p, rob, rob daviau. Bookmark the permalink.